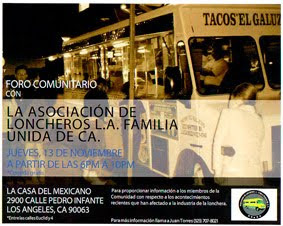 While in Canoga Park I remembered a taco reccomendation I recieved via email . This happens quite often now when I am in different parts of the city. I keep a little black book of taco destinations people have reccomended and depending where I am I consult it to see if i'm near one of them. People I am with may find this odd because I disapear at odd intervals and then reappear without telling them we're I've been. Kind've like Clark Kent except i'm not fighting any villians, I'm just eating tacos. Often i've already eatin lunch or dinner but if know that I wont be back in the area any time soon so I try to fit in a couple tacos.That's why sometimes when I review a taquiera i will only order two tacos. Not being at optimum hunger might affect a review a 1/2 pt either way but I try to stick to my formula of what makes a great taco and not judge the tacos on how hungry I was at the time. So I headed up topanga canyon in search of this Taqueria. I didn't have an address or a name but was given a general area and told to look for an orange sign. I drove up and down topanga and I was about to give up when out of the corner of my eye on a side street I saw a bright orange sign that read "El Jalisciense"
El Jalisciense which translates to "of Jalisco" has a menu with enchiladas, burritos, tamales, mariscos,and chile rellenos which I assume come from Jalsico style recipes. I didn't try any but someone sitting next to me had the enchiladas and they looked good and cheesy with lots of sauce. As far as tacos they have carne asada, al pastor, cabeza, lengua and carnitas to choose from. I ordered asada tacos and spooned some salsa roja from the salsa bar on them. 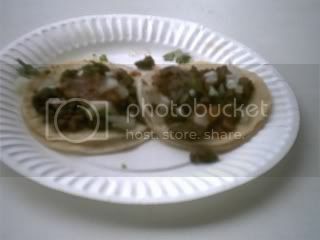 The meat was moist with lots of flavor with not a trace of fat on the taco. This is always a good sign. There is nothing worse than biting into a taco and getting a mouthful of fatty bits. How can you ever trust your taqueria again if that happened? I like to be able to just trust the taco and bite into it without worrying.As far as the rest of the taco the salsa roja was a standard taqueria salsa that didn't impress me and didn't elevate the taco. There was just no kick to it and it had a strong smokey flavor that overwhelemed the meat.The salsa bar also had a salsa verde as well as what looked like a tomato/tomatillo salsa with chopped onions. I'm partial to a strong salsa with kick that makes you reach for that cold beverage. 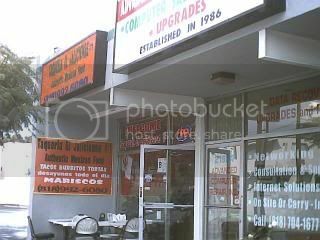 If this was my local taqueria I would eat here quite often. I dont reccomend driving out of your way for many taquierias and I dont reccomend it here either but if you live in the area I suggest checking it out and making it your local. Amazing that anyone found El Jaliciense, it's such a hole in the wall. My wife and I occasionally go there for tacos. 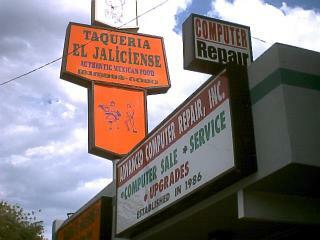 Decent tacos are hard to find in the West Valley, but we like El Jaliciense. Not a big fan of their burritos.